The Ley de Compensacion a los Trabajadores is a workers compensation law poster by the Missouri Department Of Labor & Industrial Relations. This is a mandatory posting for all employers in Missouri, and businesses who fail to comply may be subject to fines or sanctions. This poster, written in Spanish, must be posted in a conspicuous place where all Spanish speaking employees will see it. This poster describes the necessary steps that employees need to take when injured on the job to be able to get workers' compensation as well as the benefits the employees would get under workers' compensation. This poster also describes what happens when committing fraud. It appears you don't have a PDF plugin for this browser. 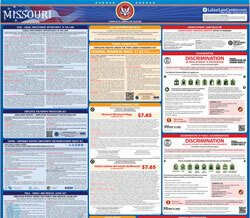 Please see the link below to download missouri-wc-106-s-ai-letter.pdf.